Playing matches is great, but good practice drills are the best way to chart your progress. In my first column I wrote about the importance of developing a strong mental game, particularly to help you in pressure situations. At the end of the column, I suggested finding a technique that will hold up when you are under pressure. Let's pick up from that point. I tinker with my technique every now and then, trying a few different things while practicing a few key drills. Then I try to imagine myself in a high-pressure situation. It's surprising how quickly you can determine whether a technique increases or decreases your odds of success under pressure. The technique that produces the most consistent results is going to be the one you want to use in big situations. I try a lot of different things in practice: adjusting my stance to test stability, cueing closer to the cue ball, changing grip pressure. Back in 2010, I went to a shorter stroke and looser grip, and it has really helped. It's important that you develop a technique that will stand the test of time. So many young players start with long, winding strokes. They love to swing and spin the cue ball around the table. That may work when your hands are steady as a surgeon's and your eyes are as sharp as an eagle's, but many players with that technique see their game become far less consistent when they are in their 40s and 50s. I look at players like Nick Varner and Buddy Hall. Both had very compact strokes and their cue ball was really tight. That's why they were still so solid late in their careers. You will discover in the coming months that I am a big believer in practice and drills. Drills - hitting the same shots over and over - are the best way to make your technique solid and consistent. The first thing I do when I practice is hit a bunch of mid-range and long, straight-in shots. The object is to make the shot and draw the cue ball back to where my bridge hand is. I'll do that 15 or 20 times, just to get the feel for the cue action. This drill gives you feedback immediately. Are you choking the cue? Is it loose in your hand? I'll try a few shots with a longer backswing and try to imagine myself under a lot of pressure. With that longer swing, the shot suddenly looks like it is 50-50. But if I have my bridge hand closer to the cue ball and use a shorter backswing, I know I'm going to make that shot 19 times out of 20. I try to keep my bridge hand about 2 � balls from the cue ball. That's just enough room so that I'm not getting trapped. As for the backswing, my hand only comes back about 6 inches. Additionally, when I'm under pressure I try to use center ball all the time. It's amazing how many players - even some great ones - just can't seem to hit center ball. They have to spin everything. Players in the U.S. just seem to grow up swinging the cue ball around all the time, possibly because they play so many different games - banks, 9-ball, one-pocket, 8-ball, etc. Of course, the conditions can affect how much you have to put on the cue ball. League players in bars are likely playing on older, more used cloth. But in TV competitions, with new tables and hot lights - trust me - the goal is to use center ball and keep the game simple. Having a strong technique and learning to use center ball comes into play when you play on really tight pockets, or in an event like the Chinese 8-Ball World Championships, where the tables have 3 �-inch rounded pockets with 2 �-inch pool balls. You have to hit the center of the pocket, and the rounded corners prevent you from cheating the pocket or hitting a diamond up the rail and still making the ball. After I've set up straight shots longer and longer and consistently make them, I know my stroke is good. I consider this drill the most important drill you can do, because that long, straight shot is the one that will test you the most when you are under pressure. Any body movement or too much cue action and you will come across the cue ball and miss to the left or right. If you're making those long shots 95 percent of the time, you know there is nothing wrong with your fundamentals. I practice this drill so much that I know if I ever miss it in a match, it's my own fault. Once you know your stroke and fundamentals are solid, the game is all about learning the angles, pattern play and spinning the cue ball when needed. There are plenty of drills that will help you get those elements of your game in order. One of my favorite drills is lining up 15 balls down the middle of the table, alternating the sequence from one end of the table to the other. 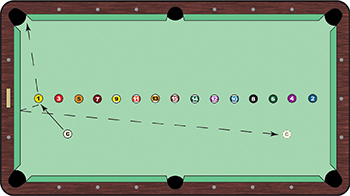 Shoot the balls in order, with the caveat that the cue ball must stay on one side of the table and you can't contact another ball in the rotation. This drill really forces you to work on cue ball control, and it's a great drill for learning to stay on the right side of the object ball. If you don't land on the right side of the ball, particularly in rotation games like 9-ball or 10-ball, you're always chasing the game. You see that when a snooker player tries to play pool. He can shoot anything into the center of the pocket, but he's always on the wrong side of the ball because he doesn't know the patterns. Thorsten Hohmann and Ralf Souquet are great examples of players who make the game easier because their patterns are great and they're always on the right side of the ball. This is one of my favorite drills for a good amateur or pro-level player, but the great thing about most of the drills I do is that you can increase or lessen the difficulty of the drill. Using all 15 balls in this drill is difficult, so just start with nine or 10. As you get better, make the drill harder. You can do that many ways. But challenge yourself. It's a great way to get quantifiable feedback and to see improvement in your game. Cue ball control and pattern play are the greatest weaknesses in amateur players. Much of that is due to the fact that they just don't practice this way. I gave a tough drill to an amateur player once and it took him six months to complete it. But he stuck with it and was so happy when he completed it. He has since added tougher drills and has been completing them, so obviously his game has shown massive improvement. If he weren't doing the drills, he probably would not even realize how much his game has improved.